The world’s two top-ranked ‘crossers, Lars Van Der Haar and Sven Nys go head-to-head in the 2014 Clif Bar CrossVegas race in the Nevada desert on September 10th, but that isn't the only duel going down. ACCORDING to the CrossVegas organisers the season’s big opening race in the Nevada desert is a showdown like "a classic Hollywood western movie with the young challenger calling out the legendary veteran in a dusty western town." Belgian champion Sven Nys will be defending his Vegas crown on (Wednesday night/Thursday morning) September 10th and the race will provide an intriguing early season duel with Dutch champion Van Der Haar, who won CrossVegas in 2011. Nys returns to Vegas after a dream solo victory last season in the rainbow jersey of World champion. 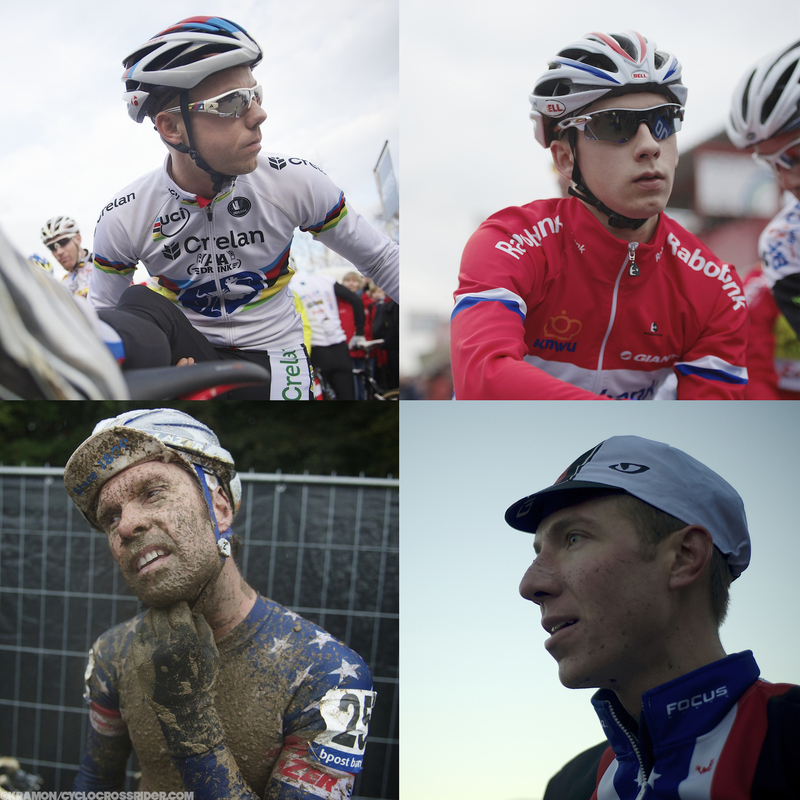 Clockwise (from top left): Sven Nys, Lars van der Haar, Jeremy Powers and Jonathan Page meet in Vegas. There is also a big, domestic US clash that should not be overlooked as well. Two-time American champion Jeremy Powers and four-time champion Jonathan Page should also be in the mix. Katie Compton and Helen Wyman, ranked one and two in the UCI World rankings also meet in the women's race. We have a full pre-season interview with Jeremy Powers here. "Racing against Sven will be hard, but it’s cool to meet him for the first race in America. We are both far away from home, so anything can happen,” says Dutch champion Van Der Haar. Other names to watch out for in the men’s race are the Telenet-Fidea trio of Thijs van Amerongen (NED), Quinten Hermans (BEL) and Daan Soete (BEL) and Geoff Kabush (CAN) who was third last season. Ryan Trebon (USA) the only two-time winner of CrossVegas, has sadly had to withdraw from the race after breaking a couple of ribs in a hard fall on Sunday (September 7th). Dutchman Van der Haar might be considered the slight favourite over a dry and fast course like Vegas especially after his great start to last season and overall victory in the World Cup. The 2014 women’s race, sponsored by Lazer helmets, is also a thoroughly international affair headed by Katie Compton (USA) and Helen Wyman (GBR). The top two ranked riders in the world are joined by a host of others including Katerina Nash (CZE), Catherine Pendrel (Canada), Lisa Jacobs (AUS), Gabby Durrin (GBR), Elle Anderson (USA) and Meredith Miller (USA). Lazer’s sponsorship includes providing a prize list that equals the Elite Men's prizes with over $8,700 across 30 places. The Belgian company also plan a women’s specific helmet line in 2015. American champion Jeremy Powers on a red, white and blue Focus Mares. Lars van der Haar stays with the disc-shod Giant TCX. Sixty men are listed on the Cross Vegas start list and 58 elite women. Impressive line-ups in both races... Start lists. The live webcast on (local time) Wednesday, September 10 will start with a pre-race show beginning at 19:45 (PDT - which is actually Thursday morning European time). Interviews and course previews will precede the Women’s Elite race at 05:20 (CEST Thursday) followed by the Men’s Elite race at 06:30 (CEST Thursday). The webcast concludes with the award ceremony for both categories.